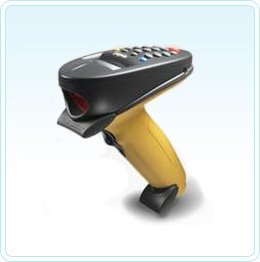 Collect data comfortably with this ergonomically designed, corded P360 bar code scanner. A forward-scanning, award-winning pistol grip allows both automatic scanning and keyed data entry for entering inventory quantities and verifying scan data. The IP54-rated sealing keeps dust, temperature and moisture from affecting its performance. A keypad and display screen allows employees to confirm bar code data immediately and reduce time spent back at a PC rechecking data. MyStore is a software application designed for the P360/P460. See our software section for more details. Allows easy software upgrades in the field. Provides ample capacity for inventory counts and look-up tables. Allows you to create custom data management applications. This UBC adapter is for use with both corded and cordless Motorola phaser scanners.